It’s winter and it’s cold. You and your children are bundled in your puffy down parkas. You pile into the car (which is also cold), blast the heat, buckle everyone up in their respective seats, and go. In this seemingly normal routine, one potentially fatal mistake could be made. I will illustrate this in pictures. As you can see in this picture, I’ve buckled my daughter into her seat. The chest strap is at armpit level. I have tightened the straps to the point that they won’t tighten any further. I followed the “rule” of not being able to pinch the fabric of the harness and I can barely squeeze one finger between the strap and her body. Now for the next picture, I unzipped her coat without adjusting the tightness of the car restraints. Are you shocked? Note, I did not adjust the belt! There is about 4 inches of slack between my daughter’s body and the seat harness. Even more shocking, this seat is a “crank-style” restraint system. I turned the knob 3 times to get it snug once again! In a collision, child restraints do not adjust like regular seat belts. Regular restraints tighten in an impact but the belts in a child seat are as tight as you initially buckled them. In a car accident, the fiber inside the coat compresses and suddenly there’s several inches of space for your child’s body to move around. In an accident, those inches could mean serious injury or even death. Therefore, the belts should be as tight as comfortably possible in order to be effective. 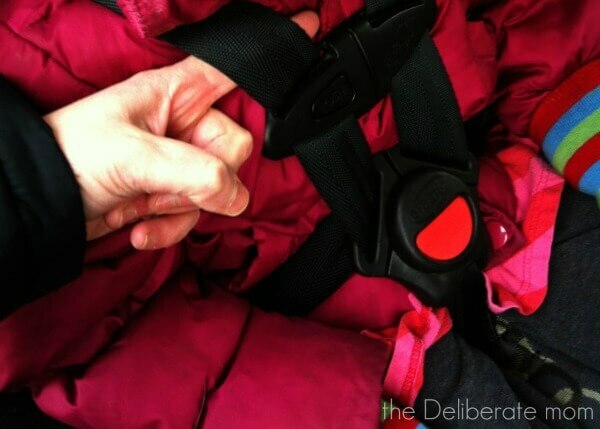 When a child is buckled into a car seat while wearing their winter coat, the restraint will never be tight enough. How do I keep my child safe and warm? Now that you know this information, you’re probably wondering what you can do to ensure your child’s safety. Have your child wear a polar fleece under their winter coat. When you get to the car take off the coat and buckle them into their seat with just the fleece on. When you get to the car, take off the coat. Buckle your child into their seat. Place their coat over them but backwards. Warm up the car prior to getting in. Place child in their regular clothes in their seat. Take your child’s coat off and buckle them into their car seat. Place a warm blanket over them. Even if you live in a warm climate or your children aren’t using car seats anymore, please consider sharing this post… it could save a life. I learned this a couple years ago and only this winter did I begin following the tips you mentioned above. I always try to warm my car up before loading the kids. They each have their own special car blankets to use as well. I would never forgive myself if something happened because of my own ignorance on car seat safety. Thanks for sharing. I learned this about 5 years ago… my oldest daughter was 2! I was stunned I had not heard of it sooner. The funny thing is when I was buckling her in while she was wearing her snowsuit, it didn’t feel right. My instincts were screaming that it was unsafe. We live in Alberta and I see parents doing this all the time. It’s frightening. Thanks for sharing your thoughts on this Monica. Scary, but also learned this myself a few years back. And by the mention of the first time buckling my baby into the car seat from the hospital drive home, sure brought back some memories indeed. Thanks though for sharing with us!! :) xoxo!! I learned this when my oldest daughter was 2. I was mortified that I hadn’t heard of it sooner… and people still don’t know about it. So scary. Who knew? I had no idea that a few inches would make a difference either!!!! Thanks for sharing — this is going to help SO many mommas!!! I was mortified when I found out but so thankful that I did. I hope this helps others too. Thanks for sharing your thoughts on this Caroline. Such a great reminder, Jennifer! Thanks Sarah… and I saw your tweet. Thank you so much for sharing. It scares me when I see/hear that people are still doing this! Hi Jennifer! I always used car seats for my kids, and I’m sure I messed up on this ‘winter coat’ advisory. My daughter does removed the puffy coats on her two year old when in the car, and then uses just a fleece. I never really knew why, but thanks to you, now I do! Oh yay! I’m glad I could help clear up that mystery. I actually didn’t find out about this until my oldest child was a bit older than two. I was mortified that I had been doing it all wrong! Wow! What a difference! This will be good to remember when Caleb’s wearing coats next winter! It’s a huge difference… scary to think what those inches could do too. This is so important. Dylan can’t stand those straps being tight, he often tries to pull his way out of them but I make sure the beast can’t be unleashed because it’s SO dangerous. Everything serves its purpose, and those straps must be STRAPPED! I’m glad I don’t have to worry so much about the big jackets/bulk because that would make Dylan even more rowdy and pissy at me. He’s so temperamental. I once read that car seats are the best because they are the only way a parent can legally completely restrain their child. Very good reminder! We usually do blankets when it is cold. Do you bring your blankets out to the car with you or do they stay in the car? Our car is parked outside, so blankets would be super cold if we left them in there. 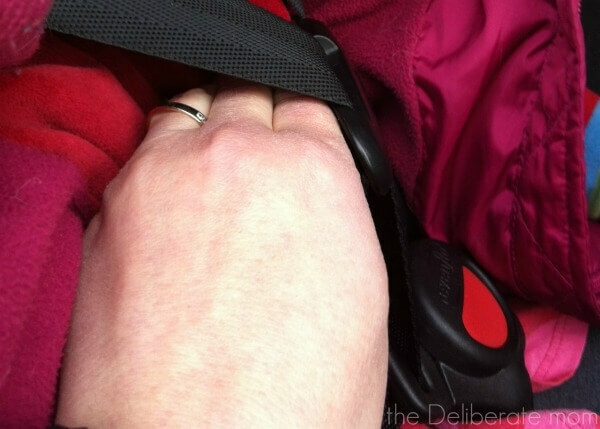 Seems like I’ve known this tip for a while and there’s actually a jacket (Cozywoggle) that you don’t need to totally remove when buckling your child in. I did a review on them about a year ago and Madison still wears it to this day. I plan on getting a bigger size when she outgrows it. I’m glad you’re sharing this tip though because a lot of parents don’t realize it. That sounds like a great jacket! We usually wear our polar fleece in the car. Thanks for sharing your thoughts on this. You’re right… a lot of parents aren’t aware of this safety tip. I had no idea this was an issue…this could help so many! And yes we live in a warm climate,but sharing nonetheless. Have a great week! I think a lot of people don’t realize this as a safety precaution. It’s good everyone knows about it though… even if it’s grandparents who occasionally drive the children somewhere or people who live in a warm climate, who may visit a cold climate on occasion. Those 3-4 inches could cause severe injury or even death. It’s frightening. So with that being said… thank you so much for sharing! Proper car seat use is so important! Thank you so much for sharing this! Agreed! I wonder if the hospitals and public health centres share this tip now. I know when I had my children they didn’t share it. Thanks for this helpful tips. I think I will adopt warming up the car before we get in. Take Care Jennifer. I warm up the car and take off their coats but they wear polar fleeces underneath. It can be super cold here in Alberta! This is a wonderful post. I am going to share it. It’s timely in the winter and everyone thinks you have to bundle kids up. We always take our jacket off as soon as we get to the car because of the seat belt. Although where we live it is never really too cold so wearing a polar fleece is a great idea! We take off our jackets and wear polar fleece too. I try to remember to warm up the car but I don’t always remember. Our carseat has a snug system that tells you when it’s tight. We rarely put A’s coat on b/c it’s just so bulky in a car seat. Really great tips Jennifer! Glad you enjoyed this Tiffany… and thanks for sharing your thoughts on car seat safety. I have friends that say they loosen the straps just a little because their kiddos hate it so much. My kids don’t throw a fit though at the tightness because they are used to it and have never known anything else. Eeek! That’s not right! The straps have to be snug enough– so scary. We went up north this past weekend and had to face this dilemma. It’s definitely annoying to have to take their coat off when it’s so freezing cold outside and the carseat feels like an icicle, so I can see why parents unknowingly do it. Luckily I knew this tip already so I told my husband “No….you gotta take their jackets off.” When we couldn’t have the car warmed up, we just put the jackets back over them as a blanket like you mentioned. Awesome tip, I know this is a very common mistake a lot of parents make! It is annoying to take off coats– especially when it’s -30C outside like it gets sometimes here. This is a common mistake. When I worked in childcare, I saw it all the time… terrifying! We often did a car seat safety campaign so that parents would know about this. Thanks for sharing your thoughts on car seat safety Jessica. This is so useful! The hospital from where I delivered had courtesy checks for car seats for the newborns, and I remember them giving me this very same tip! Since then, I’ve strapped my daughter the same way everytime–fleece to keep her warm, coat on her lap as a blanket. It’s all she’s known, and it puts my mind at ease knowing she’s safe. Thank you for sharing this! My hospital did the same thing except no one ever shared this tip. Maybe it was because we didn’t use a winter coat… our seat had a built in bunting bag. Such a good reminder! I was also so nervous buckling my son into his car seat for the first time. Luckily this winter he has a fleece lined coat that is warm, but not super thick. It works well in his car seat. We always keep a blanket in the car too. Thanks for sharing this tip! Fleece is the best isn’t it! My girls always wear a polar fleece under their winter coats exactly for this reason. 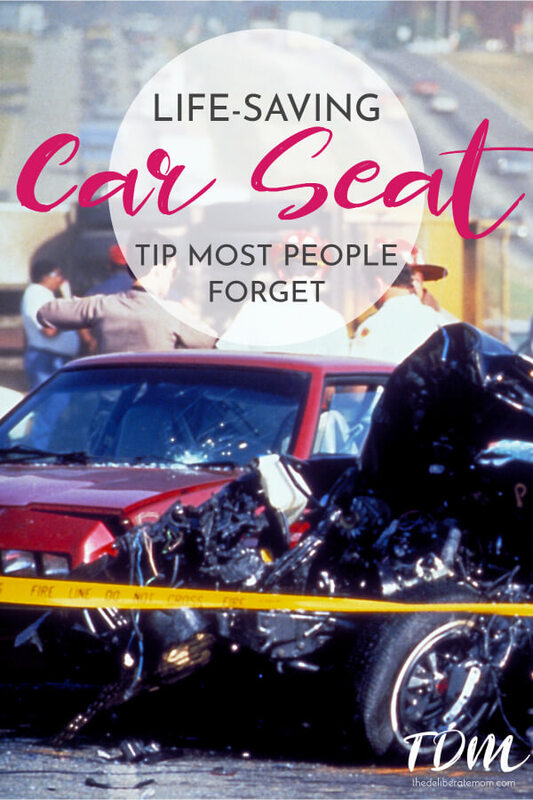 Thanks for sharing your thoughts on this car seat safety tip Chelsea! VERY interesting! Good to know for when I have kids someday!! I never knew this until my oldest daughter was about two! I was mortified when I found out! I did not know that. Great tip! Lots of people don’t know this car seat safety tip. I didn’t find out until my oldest daughter was about two! We do all four of your options, just depending on the temperature. Winters aren’t too bad in Utah but in Wyoming and it’s -25 degrees, we definitely start the car first! Great tips, Jennifer! I sometimes forget to start the car first and my girls fuss– rightfully so, when I place them without coats into a freezing cold car seat. We have to be safe though and it does warm up quickly. This is such great information! I think you should have to get a certificate in car seat safety before you are allowed to take baby home. I am amazed at how many parents don’t know how to properly install the seat, let alone strap the child in. Thank goodness for the free workshops or I would not have known either. So scary. Good point about the workshops. When our first child was about to be born we asked a police officer to help us install the seat the first time. She also gave us great tips for adjusting the seat as our baby grew. Definitely worth the time to learn how to use the car seat. I agree, a certificate in car seat safety would be a wonderful way to ensure everyone knows what’s safe and what isn’t. Thanks for sharing your thoughts on this car seat safety tip Simone. I’ve been using car blankets during the winter simply because my kids prefer it to wearing their coats even though we live in North Idaho. (It’s been worse since Frozen came out – “the cold doesn’t bother me” is my daughter’s catch phrase.) Now I won’t feel bad about their winter coats getting so little use! It gets to be -35C here and I need to do a variety of things to keep the kids warm. I warm up the car and put their coats over their laps. I think I’ll need to do car blankets too. Thanks for sharing your thoughts on this car seat safety tip Amanda!